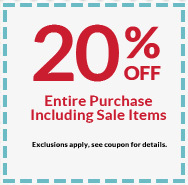 Michaels just released a new coupon here good for 20% off your entire purchase including sale items. This coupon is only valid February 4th and 5th. 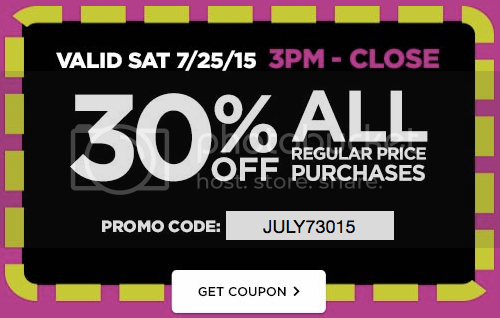 Today 7/25/2015, From 3PM-Close, Michaels is offering up a coupon valid for 30% off your entire regular priced purchase! Just go to print your coupon or pull it up on your smartphone while shopping. If you’d like to shop online, be sure to use the promo code JULY73015 at checkout. 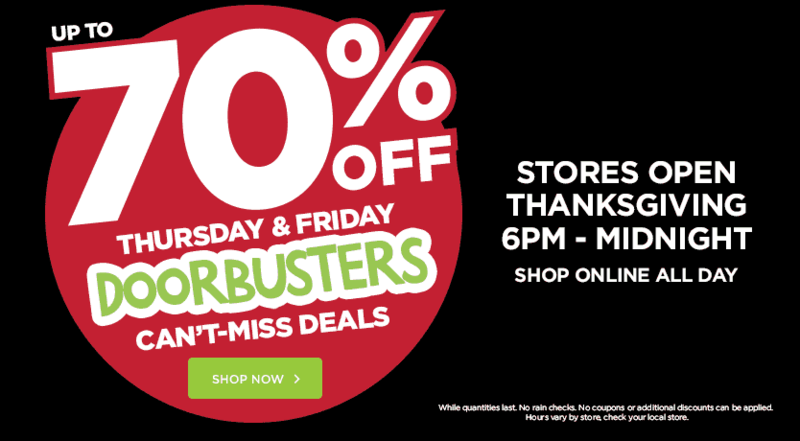 Today only from 4PM-9PM, Michaels is offering 20% Off your Entire purchase including sale items – use in-store or online (use the code WEDJAN2716 for online orders)! Head here to print your coupon or pull it up on your smartphone while shopping. Starting today and through March 31st, Michaels is offering 20% Off Your Entire Purchase including sale items – use this coupon in-store or online (use the code THANKS2016 for online orders)! You can also score a 40% off Any One Regular-Priced Item coupon (use the code 40MARCH2716 for online orders). 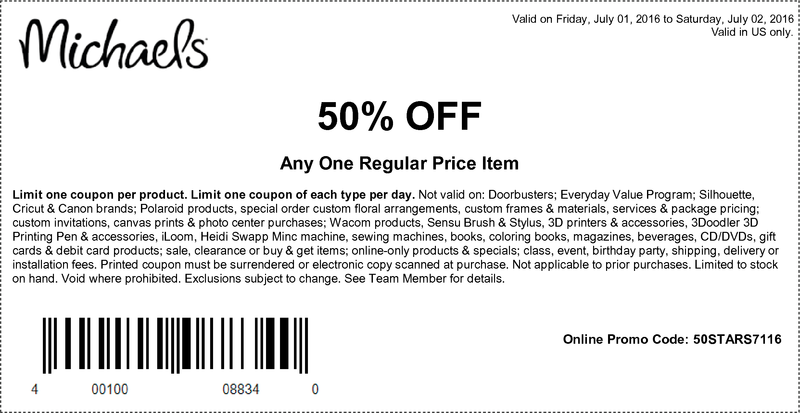 Today, July 2nd only, Michaels is offering 50% Off any ONE Regular-Priced Item – use this coupon in-store or online (use the code 50STARS7116 for online orders)! If shopping in-store, head here to print your coupon or pull it up on your smartphone while shopping or you can select the ‘Text to Phone’ option to receive the coupon via text message. 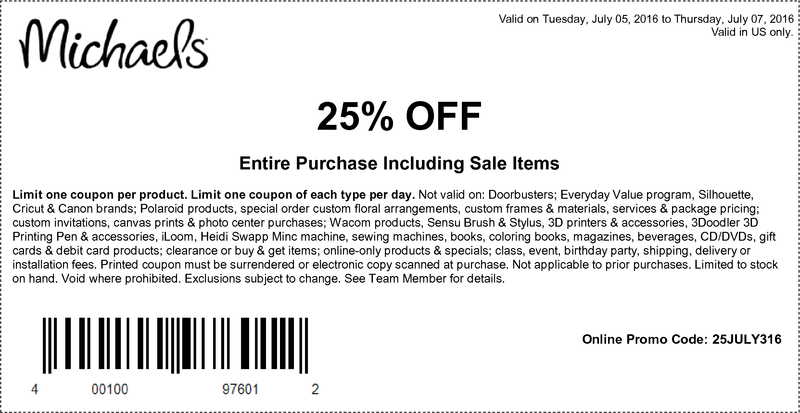 Through tomorrow, July 7th only, Michaels is offering 25% off Your Entire Purchase – INCLUDING sale items – use this coupon in-store or online (use the code 25JULY316 for online orders)! Note that the Doorbuster items are excluded from this coupon. Today only from 4PM – 8PM, Michael’s is offering free shipping on ALL orders when you use promo code AUG16FREEW at checkout! In addition, through August 13th, you can save 40% off one regular price item when you use promo code CLASS8716 at checkout and 40% off regular price Jolee’s & Paper House Stickers with code STICKR8716 at checkout. Through today only, Michaels is offering 40% Off ONE Regular Price Item Purchase – use this coupon in-store or online (use the code CLASS8716 for online orders)! If shopping in-store, go here to print your coupon or pull it up on your smartphone while shopping or you can select the ‘Text to Phone’ option to receive the coupon via text message. Today only, Michaels is offering up 30% off your entire purchase – including sale items when you use the code THANKS116 at checkout (excludes doorbusters and everyday value items). Artist’s Loft Arts & Crafts Creative Center for just $69.99 when you use the code THANKS116 (regularly $199.99) and use the code 3TURKEYW to score $3 shipping which makes the final cost just $72.99 shipped to your door. Made from durable, heavy gauge steel, this desk features an extended work surface, slide-up pencil ledge, built-in art tray and cup holder, under-table shelf and drawers and a stool with padded seat. Today, December 18th only, Michaels is offering up the Orbeez Super Fine Crush Magic Chef Set for only $15 (regularly $29.99) both in stores and online. This set includes 14 Orbeez seed packs, 5 recipe cards, 2 spatulas, 2 sushi wraps, 1 sushi leaf, 1 ice cream cone, 1 spoon, 1 measuring cup, 1 large crusher, 1 mini crusher, 1 bowl, 1 plate, food molds and the machine. TODAY, March 27th only, Michaels is offering All Watches for just $5 (Regularly $10) both in-stores and online – no promo code needed! Even better, if shopping online, you can get an additional 10% off your purchase when you use promo code AB10ENTIRE at checkout!